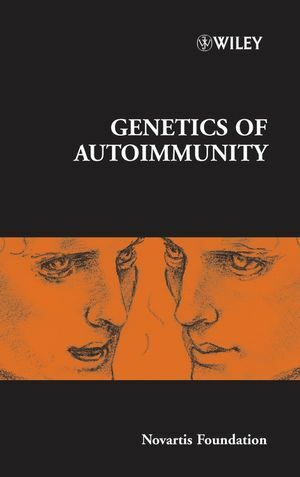 This title provides an extremely helpful analysis of genes that may be associated with autoimmunity, and answers questions such as how these genes can be identified, and how the functions of the gene products can be elucidated. discusses the importance of developing criteria for establishing the significance of these different categories of disease-associated loci. Symposiumon Genomics of autoimmunity, held at the Novartis Foundation, London, 22-24 June, 2004. This symposium is based on a proposal by Abul Abbas, David Hafler and John Rioux. Mark Daly: Patterns of genetic variation in humans and mice. David B. Goldstein: Haplotype tagging in pharmacogenetics. Simon J. Foote, Justin P. Rubio, Melanie Bahlo, Trevor J. Kilpatrick, Terence P. Speed, Jim Stankovich, Rachel Burfoot, Helmut Butzkueven, Laura Johnson, Chris Wilkinson, Bruce Taylor, Michele Sale, Ingrid A. F. van derMei, Joanne L. Dickinson and Patricia Groom: Multiple sclerosis: a haplotype association study. Juha Kere: Mapping genes for asthma and psoriasis. Linda S. Wicker, Carolyn L. Moule, Heather Fraser, Carlos Penha-Goncalves, Dan Rainbow, Valerie E. S. Garner, Giselle Chamberlain, Kara Hunter, Sarah Howlett, Jan Clark, Andrea Gonzalez-Munoz, Anne Marie Cumiskey, Paul Ti¡en, Joanna Howson, Barry Healy, Luc J. Smink, Amanda Kingsnorth, Paul A. Lyons, Simon Gregory, Jane Rogers, John A.Todd and Laurence B. Peterson: Natural genetic variants influencing type 1 diabetes in humans and in the NOD mouse. Srividya Subramanian and Edward K. Wakeland: The importance of epistatic interactions in the development of autoimmunity. Timothy J. Vyse, Angela Richardson, EmilyWalsh, Lisa Farwell, MarkJ. Daly, Cox Terhorst and John D. Rioux: Mapping autoimmune disease genes in humans: lessons from IBD and SLE. Cisca Wijmenga and Martin C. Wapenaar: A combined genetics and genomics approach to unravelling molecular pathways in coeliac disease. Timothy W. Behrens, Robert R. Graham, Chieko Kyogoku, Emily C. Baechler, Paula S. Ramos, Clarence Gillett, Jason Bauer, Ward A. Ortmann, Keli L. Hippen, Erik Peterson, Carl D. Langefeld, Kathy L.Moser, Patrick M. Ga¡neyand Peter K. Gregersen: Progress towards understanding the genetic pathogenesis of systemic lupus erythematosus. Vigo Heissmeyer, Fernando Macia¤ n, Rajat Varma, Sin-Hyeog Im, Francisco García-Cozar, Heidi F.Horton, Michael C. Byrne, Stefan Feske, K. Venuprasad, Hua Gu, Yun-Cai Liu, Michael L. Dustin and Anjana Rao: A molecular dissection of lymphocyte unresponsiveness induced by sustained calcium signaling. Adrian Liston and Christopher C. Goodnow: Genetic lesions in thymicTcell clonal deletion and thresholds for autoimmunity. Lalitha Vijayakrishnan, Jacqueline M. Slavik, Zsolt Illés, Dan Rainbow, Laurence B. Peterson, Arlene S. Sharpe, Linda S. Wickerand, Vijay K. Kuchroo: An autoimmune disease-associated CTLA4 splice variant lacking the B7 binding domain signals negatively in Tcells. Adrian Ting, Stefan Lichtenthaler, Ramnik Xavier, Soon-Young Na, Shahrooz Rabizadeh,TaraHolmes and Brian Seed: Large-scale screens for cDNAs with in vivo activity. Jenny Ting: Genomic mining of new genes and pathways in innate and adaptive Immunity.